(Black PR Wire) Washington –In the latest significant effort towards preserving the rich cultural legacy of Historically Black Colleges and Universities (HBCUs), the National Trust for Historic Preservation named Morgan State University a National Treasure. The National Trust and Morgan State University have partnered to develop a preservation plan that stewards the many historic buildings on campus, while planning wisely for the university’s future. Founded in 1867 as one of the nation’s earliest institutions to offer post-secondary education for African Americans and the largest in the state of Maryland, Morgan State University’s urban campus has an impressive collection of historic buildings. The University’s varied built landscape now features 20 contributing structures—ranging from Classical and Italianate to Modern and Brutalist—eligible for listing on the National Register. Buildings on the campus were designed by pioneering and celebrated black architects such as Albert Cassell, Hilyard Robinson, Louis Fry, and Leon Bridges. National Treasures are a portfolio of highly-significant historic places throughout the country where the National Trust makes a long-term commitment to find a preservation solution. As the presenting partner of the National Treasures program, American Express has pledged $6 million to help promote and enable the preservation of these cultural and historic places. For more information, visit www.savingplaces.org. The National Trust for Historic Preservation is a privately funded nonprofit organization that works to save America’s historic places. For more information, visit www.savingplaces.org. 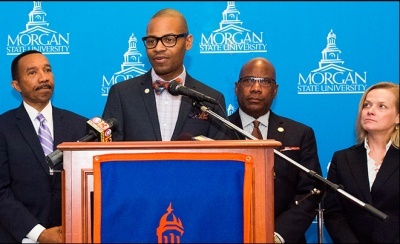 Morgan State University, founded in 1867, is a Carnegie-classified Doctoral Research Institution offering more than 70 academic programs leading to bachelor’s degrees as well as programs at the master’s and doctoral levels. As Maryland’s Public Urban Research University, Morgan serves a multiethnic and multiracial student body and seeks to ensure that the doors of higher education are opened as wide as possible to as many as possible. More information about the university is available at www.morgan.edu.